Austrian family whose name has been rendered illustrious by the great preacher Adolf Jellinek. Austrian rabbi and scholar; born June 26, 1821, at Drslawitz, Moravia; died Dec. 29, 1893, at Vienna. 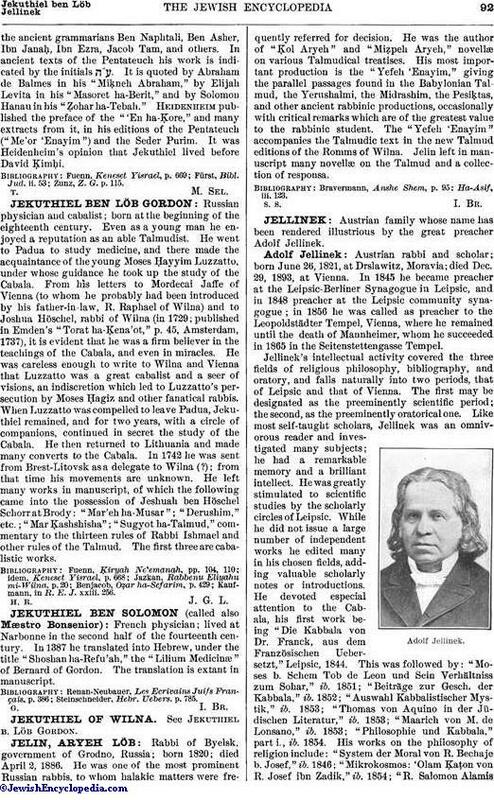 In 1845 he became preacher at the Leipsic-Berliner Synagogue in Leipsic, and in 1848 preacher at the Leipsic community synagogue; in 1856 he was called as preacher to the Leopoldstädter Tempel, Vienna, where he remained until the death of Mannheimer, whom he succeeded in 1865 in the Seitenstettengasse Tempel. Jellinek's intellectual activity covered the three fields of religious philosophy, bibliography, and oratory, and falls naturally into two periods, that of Leipsic and that of Vienna. The first may be designated as the preeminently scientific period; the second, as the preeminently oratorical one. Like most self-taught scholars, Jellinek was an omnivorous reader and investigated many subjects; he had a remarkable memory and a brilliant intellect. He was greatly stimulated to scientific studies by the scholarly circles of Leipsic. While he did not issue a large number of independent works he edited many in his chosen fields, adding valuable scholarly notes or introductions. He devoted especial attention to the Cabala, his first work being "Die Kabbala von Dr. Franck, aus dem Französischen Uebersetzt," Leipsic, 1844. This was followed by: "Moses b. Schem Tob de Leon und Sein Verhältniss zum Sohar," ib. 1851; "Beiträge zur Gesch. der Kabbala," ib. 1852; "Auswahl Kabbalistischer Mystik," ib. 1853; "Thomas von Aquino in der Jüdischen Literatur," ib. 1853; "Maarich von M. de Lonsano," ib. 1853; "Philosophie und Kabbala," part i., ib. 1854. His works on the philosophy of religion include: "System der Moral von R. Bechaje b. Josef," ib. 1846; "Mikrokosmos: 'Olam Ḳaṭon von R. Josef ibn Zadik," ib. 1854; "R. Salomon AlamisSittenlehre," ib. 1854; "Der Mensch von Sabb. Donolo," 1854. He published with scholarly introductions a collection of small midrashim taken partly from manuscripts, partly from printed books, and entitled "Beth ha-Midrasch" (six parts, 1853-78). Others of his editions are commentaries by Tobiah b. Eliezer, Solomon b. Meïr, Simon b. Ẓemaḥ, Joseph Bekor Shor, and Jedidiah Solomon Norzi. Very valuable are his six bibliographies (1876-78) on the earliest commentators of the Talmud ("Ḳonṭres ha-Mefaresh"), Jewish proper names ("Ḳonṭres ha-Mazkir"), haggadic hermeneutics ("Ḳonṭres ha-Maggid"), the 613 precepts ("Ḳonṭres Taryag"), Maimonides' legal code ("Ḳonṭres ha-RaMBaM"), and the methodologic-hermeneutic and chronological literature to the Midrash and the Talmud ("Ḳonṭres ha-Kelalim"). In this connection must also be mentioned Jellinek's index to the German translation of De Rossi's "Dizionario" (1839-46). While Jellinek's most valuable scientific works were produced during his sojourn at Leipsic, his oratorical achievements culminated at Vienna. Although his discourses printed at Leipsic gave indication of latent power, he at this time was still under the influence of Salomon, the famous preacher of Hamburg; but as soon as he went to Vienna he manifested his independence. "The air of the large city bewitches one," he was wont to say; and he certainly would not have reached his commanding position if he had not occupied the pulpit at Vienna. Jellinek was the greatest, most gifted Jewish preacher that modern Judaism has produced. His thorough knowledge of the Midrash, and the startling uses he made of it in his sermons, distinguish him especially from all his contemporaries and predecessors. In his discourses he is the most brilliant apologist of Judaism and the most accomplished and courageous opponent of all its enemies, both within and without the Synagogue. All his addresses are timely answers of Judaism to present-day questions and problems of intellectual and national life, of religion and science. With admirable insight he immediately recognizes in every midrash the whole structure of the original discourse, as he strikingly proved in the sermon "Eine Alte Schutzrede für die Proselyten" ("Zeitstimme," ii. 19). Jellinek printed about 200 discourses, singly or in volumes. Three parts, containing 68 discourses, were published in the years 1862, 1863, and 1866; and the following later: "Das Weib in Israel" (Vienna, 1866), two discourses; "Das Gesetz Gottes Ausser der Thora" (1867), five discourses; "Schema Israel." 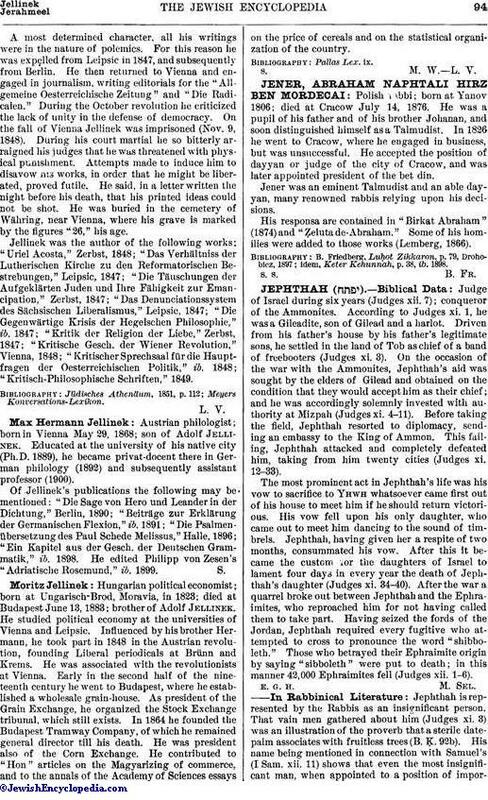 (1869), five discourses; "Zeitstimmen" (1870-71), two parts, eighteen discourses; "Bezelem Elohim" (1871). For the seventieth birthday of I. N. Mannheimer he issued "Nofeth Zufim, R. Jehuda Messer Leons Rhetorik nach Aristoteles." Jellinek was one of the most productive homiletic writers, the modern classical haggadist par excellence. His "Der Jüdische Stamm" (1869) and "Der Jüdische Stamm in Nichtjüdischen Sprüchwörtern" (1881-82) are psychologic and ethnologic studies. Morais, Eminent Israelites of the Nineteenth Century, Philadelphia, 1880. Hungarian deputy; born March 15, 1851. He studied law at the University of Vienna (Ph. D. 1875). In 1876 he opened a law office at Budapest, and in the following year he was elected to the Parliament (Diet). He drafted among other bills that on the jurisdiction of the courts in electoral matters, also the general report on marital laws; and he has contributed many articles on legal topics to the periodicals "Themis," "Togtudományi Közlöny," and "Ügyvédeklapja." His chief works are Katonai Büntetöjog ei Katonai Eskü" (1884) and "A Magyar Magánjog mai Ervényében" (1886). Austrian jurist and author; born at Leipsic June 16, 1851; son of Adolf Jellinek; educated at the universities of Heidelberg, Leipsic, and Vienna, where he studied law and philosophy. He entered the Austrian government service in 1874, but resigned in 1879 to become privat-docent at Vienna University. Appointed professor of jurisprudence in 1883, he resigned in 1889. The following year he was appointed professor at Basel, and since 1891 he has held the chair of international law at the University of Heidelberg. He studied Orientalia at the University of Prague and later in Leipsic. Among his works may be mentioned the following, all, with one exception, published in Vienna: "Die Sozial-Ethische Bedeutung von Recht, Unrecht und Strafe," 1878; "Die Rechtliche Natur der Staatenverträge," 1880; "Die Lehre von den Staatenverbindungen," 1882; "Oesterreich-Ungarn und Rumänien in der Donaufrage," 1884; "Ein Verfassungsgerichtshof für Oesterreich," 1885; "Gesetz und Verordnung," Freiburg-in-Baden, 1887; "System der Subjektiven Oeffentlichen Rechte," 1892. Born at Budapest Dec. 21, 1853; son of Moritz Jellinek. After having studied the street-railway system of the Continent, he entered the offices of the Budapest Tramway Company, and later succeeded his father as its president. He introduced electric traction, and extended the system to the environs of Budapest, establishing the branches Budapest-Szent-Endre and Budapest-Haraszti. He was ennobled by the king in recognition of his services. Jellinek is president of the Budapest chamber of commerce and of the Budapest Sick Fund for Working Men. 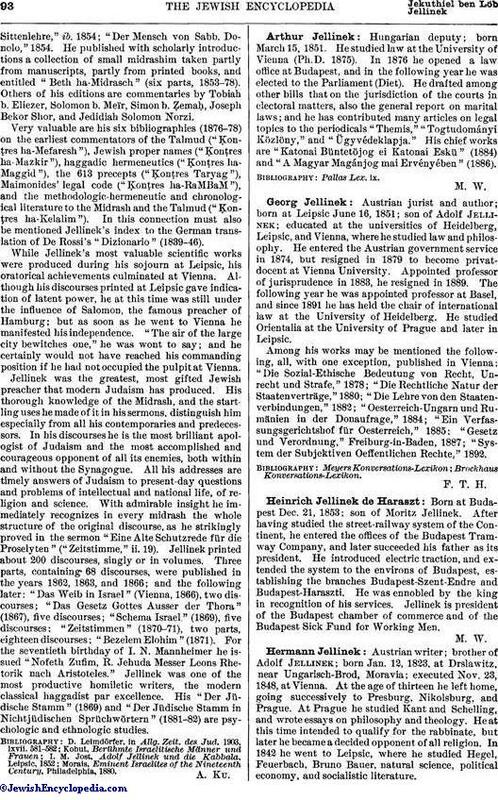 Austrian writer; brother of Adolf Jellinek; born Jan. 12, 1823, at Drslawitz, near Ungarisch-Brod, Moravia; executed Nov. 23, 1848, at Vienna. At the age of thirteen he left home, going successively to Presburg, Nikolsburg, and Prague. At Prague he studied Kant and Schelling, and wrote essays on philosophy and theology. He at this time intended to qualify for the rabbinate, but later he became a decided opponent of all religion. In 1842 he went to Leipsic, where he studied Hegel, Feuerbach, Bruno Bauer, natural science, political economy, and socialistic literature. A most determined character, all his writings were in the nature of polemics. For this reason he was expelled from Leipsic in 1847, and subsequently from Berlin. He then returned to Vienna and engaged in journalism, writing editorials for the "All-gemeine Oesterreichische Zeitung" and "Die Radicalen." During the October revolution he criticized the lack of unity in the defense of democracy. On the fall of Vienna Jellinek was imprisoned (Nov. 9, 1848). During his court martial he so bitterly arraigned his judges that he was threatened with physical punishment. Attempts made to induce him to disavow his works, in order that he might be liberated, proved futile. He said, in a letter written the night before his death, that his printed ideas could not be shot. He was buried in the cemetery of Währing, near Vienna, where his grave is marked by the figures "26," his age. Jellinek was the author of the following works: "Uriel Acosta," Zerbst, 1848; "Das Verhältniss der Lutherischen Kirche zu den Reformatorischen Bestrebungen," Leipsic, 1847; "Die Täuschungen der Aufgekläten Juden und Ihre Fähigkeit zur Emancipation," Zerbst, 1847; "Das Denunciationssystem des Sächsischen Liberalismus," Leipsic, 1847; "Die Gegenwärtige Krisis der Hegelschen Philosophie," ib. 1847; "Kritik der Religion der Liebe," Zerbst, 1847; "Kritische Gesch. der Wiener Revolution," Vienna, 1848; "Kritischer Sprechsaal für die Hauptfragen der Oesterreichischen Politik," ib. 1848; "Kritisch-Philosophische Schriften," 1849. Austrian philologist; born in Vienna May 29, 1868; son of Adolf Jellinek. Educated at the university of his native city (Ph.D. 1889), he became privat-docent there in German philology (1892) and subsequently assistant professor (1900). Of Jellinek's publications the following may be mentioned: "Die Sage von Hero und Leander in der Dichtung," Berlin, 1890; "Beiträge zur Erklärung der Germanischen Flexion," ib. 1891; "Die Psalmenübersetzung des Paul Schede Melissus," Halle, 1896; "Ein Kapitel aus der Gesch. der Deutschen Grammatik," ib. 1898. He edited Philipp von Zesen's "Adriatische Rosemund," ib. 1899. Hungarian political economist; born at Ungarisch-Brod, Moravia, in 1823; died at Budapest June 13, 1883; brother of Adolf Jellinek. He studied political economy at the universities of Vienna and Leipsic. Influenced by his brother Hermann, he took part in 1848 in the Austrian revolution, founding Liberal periodicals at Brünn and Krems. He was associated with the revolutionists at Vienna. Early in the second half of the nineteenth century he went to Budapest, where he established a wholesale grain-house. As president of the Grain Exchange, he organized the Stock Exchange tribunal, which still exists. In 1864 he founded the Budapest Tramway Company, of which he remained general director till his death. He was president also of the Corn Exchange. He contributed to "Hon" articles on the Magyarizing of commerce, and to the annals of the Academy of Sciences essays on the price of cereals and on the statistical organization of the country. S. M. W. L. V.